Both plants belong to the Araceae family, and share surprising bracts that give color to drab interiors. 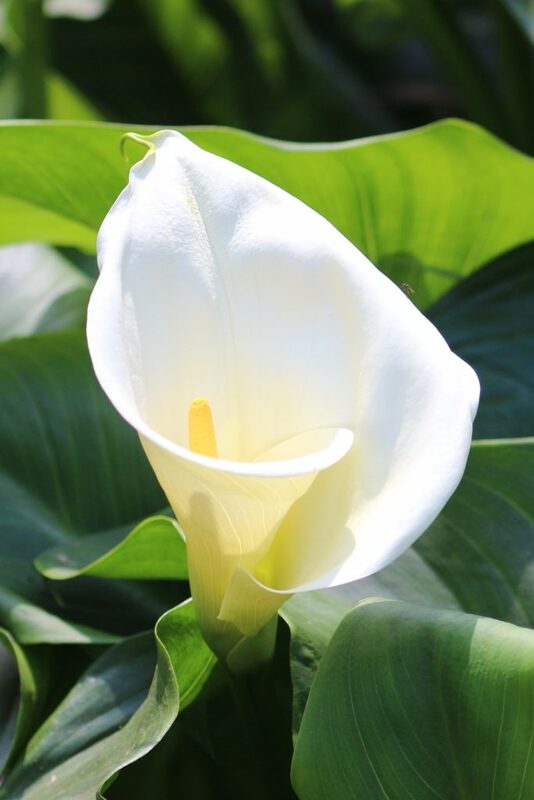 Also called Arum, calla lily (Zantedeschia aethiopica) is a tall plant, with leaves and upright calyces that are 16 to 20 inches (40 to 50 cm) tall. Their bracts, which are modified leaves, can be red, purple, cream, yellow, pink, orange, white and even black-colored! White ones are often found in bouquets, especially for bridal compositions. Black ones attract persons who have a taste for the uncommon. Their taut silhouette has inspired American artist Georgia O’Keefe, who has reproduced these flowers on many paintings in the 1930s. 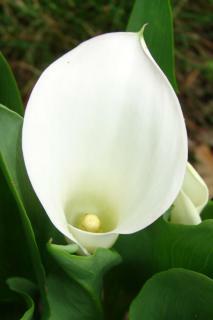 Very graphic and even a bit revealing, calla lily is native to South Africa. It loves heat (ideal temperature range is 55 to 75°F (12 to 25°C)), light and regular watering, twice a week. After flowering, in fall, leaves turn yellow. That is when to bring it indoors in a cool (non-freezing) place, without watering over the winter. It will turn green again in spring once temperatures rise. 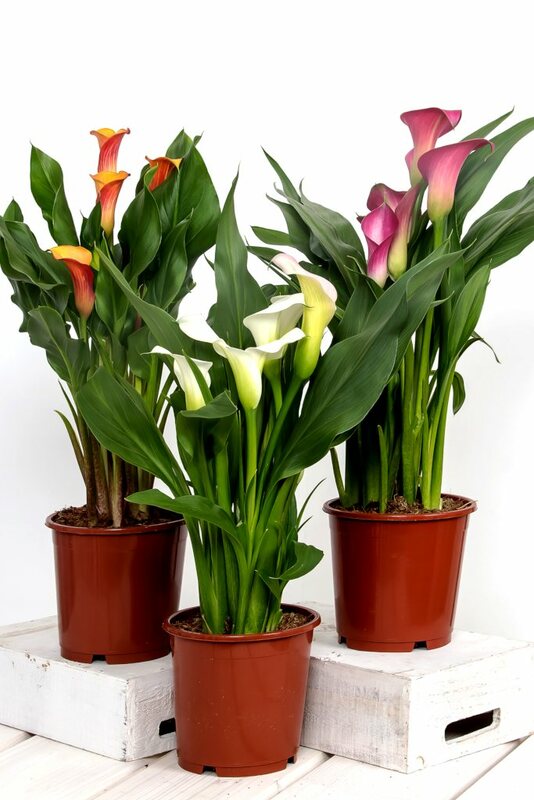 In areas with mild climates, calla lily can be successfully transferred from pot to garden. 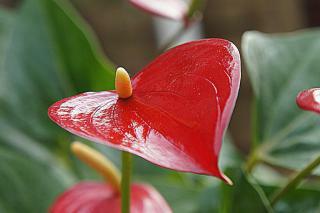 Heart shaped bracts and leaves: Anthurium is a second beautiful exotic plant from the vast Araceae family. It is native to Columbia, where it symbolizes hospitality. 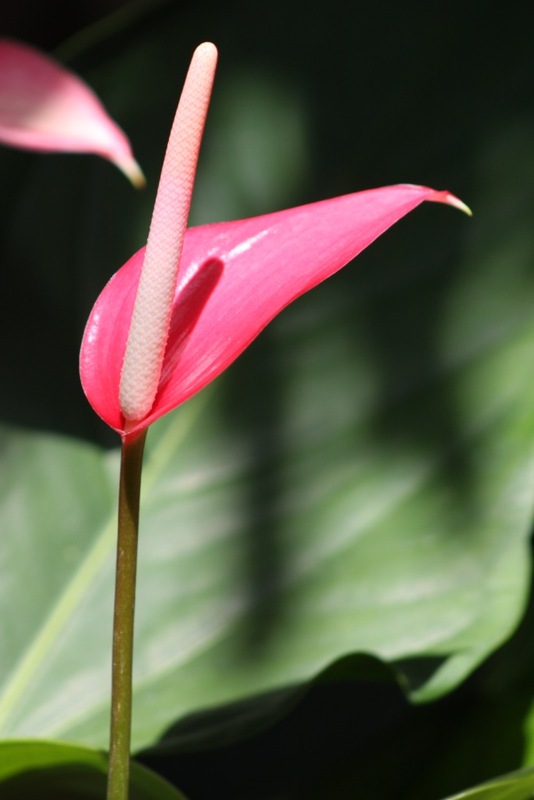 Anthurium bracts can be green or brown, but also white, red, pink or violet. Just like calla lily, flamingo flower – the other name of anthurium – requires abundant indirect light, rich soil mix and watering twice a week with lukewarm water. It also likes heat and the ideal temperature range is 65 to 75°F (18 to 25°C), except when blooming is over (in March), at which time a cooler 60°F (15°C) temperature and reduced watering is called for. To keep their leaves shiny, spray them with non-hard water, or take the pot out when it rains for a short shower.